IMBB 14: Orange you glad I made a salad? Believe me, I really did know that the assignment for this month's IMBB was not about the use of oranges. The fruit, that is. I understood from the very beginning that it was all based on color. Our wonderful hosts, LadyGoat and FoodGoat, made that quite clear. As soon as I head about the color-rich theme, I had fantasies of making a lovely orange-colored Double Gloucester Welsh Rarebit or a sunset-hued Apricot Tart -- or both. Despite my brief rumination on the possibility of an all-orange dinner, a simple orange dish was what was in the cards here, in terms of both the fruit AND the color. Of late, things have been a bit hectic foodwise -- one of those periods when you're doing so much cooking that you don't actually have time to blog about it, despite all the bloggable moments it provides. This weekend I had two Passover meals to make/contribute to, in addition to SHF and IMBB. We're also getting ready for our sojourn north to the wilds of Vermont, a state that makes any foodlover's heart beat faster. At the party we attended on Saturday night, my hostess asked if I would make and bring a few dishes. I was going to bring roasted asparagus as one of my contributions, but then it struck me that I might put that asparagus into a springtime salad platter. So above, you see my concotion -- a bed of baby romaine leaves and fresh leafy watercress, spokes of roasted asparagus interspersed with mellow avocado, juicy navel orange slices, and purple onion. The color orange had a lot of colorful friends to play with on this platter! All was dressed with a piquant vinagrette which made use of the last of the season's Meyer Lemons as well as the lovely blood orange vinegar from Cuisine Perel. As the only light, fresh, salad-y dish on a rather rich, heavy menu, this was a huge hit at the party. Many thanks to Ladygoat and Foodgoat for hosting such a fun and unusual IMBB. They've posted a round-up so quickly that I'm already enjoying the other entries! "Dude, women are like muffins. And once you've had one muffin, you'll do just about anything to get another muffin." Two kinds of baked goods are always better than just one -- don't you think? Or is that just my particular brand of greed talking? But before I get into the ridiculous state of muffin-cupcake overindulgence we've been suffering in our household, I have to say something. G is an extraordinary man. It's not just that he puts up with me, although that's quite a lot. It's not even that I get to live with a kind, loving, caring man who reserves his misanthropy for everyone else on the planet, while I'm consistently treated with tenderness and indulgence, treats and surprises. It's this: He does the dishes. Pretty much all of them. So, one day not long ago, Maki of I was just really very hungry announced the theme of cupcakes and muffins for IMBB13. Upon my musing out loud about what I might make, my paragon (who happens to be the arbiter and connoisseur of all things apple) expressed his feeling that apple muffins wouldn't come amiss if I were going to start a-bakin'. It seemed only right to comply. Truthfully, I don't really care for apple muffins overly much. If the two of us walk into a bakery, I'll always choose a pain chocolat or a mousse cake or even a strawberry tart -- sometimes fruit or cheese or almond danish. G will always find something apple -- a little rustic tart, a turnover, a muffin. I would NEVER go into a bakery and ask for an apple muffin. When I make muffins, I usually make apple for him and blueberry or pumpkin or orange chocolate chip for myself. 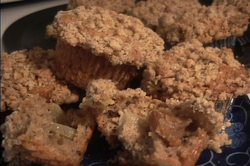 But I decided that I was going to improve upon the apple muffins, and make one that even I could appreciate. So, I took a basic muffin recipe, made enough crumble topping for a battalion of muffins, and addded both raw tart chopped apple AND sauteed chopped apple with brown sugar and spices to the batter. The muffins came out spicy and moist, with a super-crunchy crumbly top, fresh tart apple chunks and jammy pockets of sauteed apples. I did make these primarily for G, but he's gonna have to fight me for the last ones. These might be my new favorite muffin. Of course, I didn't realize I was going to like these so much, so I made something else as well. This is where true confession time begins. I hereby admit to an erstwhile low craving for a form of junk food. I honestly don't eat this anymore -- it was sort of an overweight adolescent fetish of mine. I used to love this nasty Entenmann's cake called Filled Chocolate Chip Crumb. Based on how I used to feel about this chemical-filled cake, I decided to create a muffin with the same flavors, only made with wholesome, all-natural ingredients (as the ads like to say). I came up with Chocolate-Filled Chocolate-Chip Chocolate-Crumb-Cake Muffin-Cupcakes. 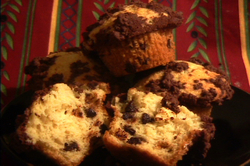 I almost added grated orange rind and orange juice, but that would have been the third time I've posted a chocolate-orange combination in the short two-month life of this blog, so I created a moist, vanilla-cake muffin with chocolate chips and a chocolate crumble topping. That was good, but I went for overkill and made chocolate filling on the second day. They weren't bad with the filling -- actually quite delicious -- and my grad students loved the samples I brought to class tonight. But I really wasn't all that enamored of the filled version. I think I've finally outgrown my taste for supersweet overly chocolatey desserts. I might just be learning that less can be more, even when it comes to dessert. Next time I make them I'd probably a) skip the chocolate filling, b) go ahead with my impulse to use grated orange rind and orange juice and c) use mini-chips instead of regular size chips. Living with someone, especially someone you love, really does cause tastes, preferences, and opinions to evolve. G now eats and enjoys chocolate much more than he did before we lived together (I have that effect on people). And I've discovered a taste for the homey delights of apple desserts. We may not need to be a two-muffin household forever -- although admittedly, it never gets boring this way. Place the walnuts and other dry ingredients in the food processor. Pulse together a few times. Add butter, and pulse until you have a sticky, crumbly mass. Reserve. Preheat oven to 375F. Grease 12-muffin pan or line with foil baking cups. Sauté one of the diced apples in butter for a few minutes. Sprinkle with brown sugar and spices, and continue sauteeing until brown and tender. Mix the raw diced apple in with the cooked apple, and set aside. Whisk together all dry ingredients in a large bowl. Break eggs into another bowl, and whisk in the sour cream and butter till blended. Pour over the dry ingredients and fold in until just moistened. Fold apples into the batter, mixing as lightly as possible. Scoop batter into prepared pan. 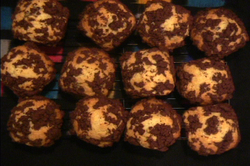 Top each muffin generously with crumble mixture, patting lightly so it adheres to the batter. Bake for 20 – 25 minutes, until a toothpick or cake tester comes out clean. Cool in pan for 10 minutes, then remove carefully from pan to cool on a rack. Delicious warm, room temp or cool. Place all dry ingredients in the bowl of a food processor. Pulse a few times till blended. Cut butter into several chunks, and place in food processor bowl. Pulse several times until a sticky, crumbly mass is formed. Set aside. Preheat oven to 375F. Line a 12-cup muffin tin with foil liners, and butter the flat top surface well. Beat butter and sugar together until light. Beat in eggs and vanilla until you have a creamy mass. In another bowl, whisk together flour, baking powder, baking soda and salt. Add flour and sour cream or yogurt in alternating thirds, mixing lightly. 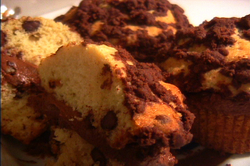 When ingredients are just incorporated, mix in chocolate chips. 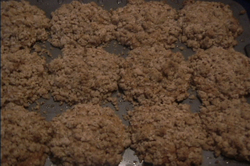 Scoop batter into prepared muffin tins, and top with chocolate crumble, patting lightly so that dough is covered and crumble adheres to the dough. Bake for 20-25 minutes, until a toothpick or cake tester comes out clean. Cool for 10 minutes in pan, then remove carefully to a rack to continue cooling. When completely cooled, fill with optional chocolate cream if desired. Beat everything together until you have a thick creamy chocolate mass. Taste, and add extra of any of the element to taste. Cut tops off muffins, fill with a layer of filling, and reassemble. Very rich and sweet – keep refrigerated, but let come to room temperature before eating. "To understand the true quality of people, you must look into their minds, and examine their pursuits and aversions." What does experimenting with IMBB 12: Food Taboos reveal about our own "true qualities" ? What do our taboos or dislikes have to tell us about ourselves? In my case, I think the jury's still out. In any case, kudos to Carlo of my latest supper for hosting this unusual edition of everybody's favorite food meme. This is my first IMBB, since my blog isn't even a month old. I've got to admit that the theme is quite a challenge. At first I thought about experimenting on my heart's companion, the enigmatic yet loveable G. I thought about all the things he doesn't like to eat. But short of torturing him with an onion-olive-avocado-mushroom sandwich (I know, it sounds good to me too), I couldn't come up with a suitable experiment. And I didn't even want to try to get him to agree to it. He probably would have eventually; he's very good-natured. But he puts up with a fair amount, and does a lot of dishes, so I figured I'd let him off the hook. His suggestion was that we trick my vegetarian sister-in-law into eating meat, and even offered to help. I gently explained that hoodwinking someone into eating a taboo food was not exactly the spirit of the idea. So I had to go with something I wouldn't like. I've done unusual meat -- I've eaten guinea pig in Peru, etc. I hate offal, but I simply couldn't get myself to go find a butcher that would provide me with brains or kidneys (not to mention the risk of prions, mad cow, etc). I figured that even if I could bring myself to actually buy the stuff, I would then spend a lot of time trying to find an appealing way to cook this awful offal. I would still hate it, G would hate it, and we would end up wasting time, money and effort since the repugnant resulting dish could only end in the trash. There are not a lot of foods that I hate. I'm a pretty brave taster, and am willing to go with unusual combinations and try new things. There's just one sort of nice, homey, everyday food that everyone else seems to like, but which I simply loathe. Banana cake or bread: I just hate it, I don't know why. I don't hate bananas. I'm fond of them in cereal or yogurt; I love chocolate ice-cream with sliced bananas. I even like some forms of cooked bananas -- sweet fried bananas or maduros are great, and I love Bananas Foster -- as long as there's no banana extract or banana liquor or anything that has that concentrated banana oil smell. That's what gets me, that smell-taste of concentrated banana oil that you find in banana baked goods or banana-flavored items. It just makes me want to gag. But why not conquer this irrational abhorrence? Then I could join the happy hordes of those who rave over Nigella's banana bread. I could go to bake sales without a surgical mask. I could attend my graduate class end-of-term potlucks without having to pretend to eat some hapless student's banana loaf, proudly shown off and generally described as a treasured family recipe which is then offered to me. I usually make polite, non-committal noises, hoping that my shudders are not noticeable while thinking that it would be really sad if they were trying to bump up their grades this way. While not exactly a phobia or maybe even a true taboo, it seemed to me that an antipathy like this fit the necessary criteria for the challenge. I decided that this would be my culinary bête noire to play with for IMBB. I figured that at the very least, even if I hated what I made, G would eat it since banana baked goods are not one of his aversions. 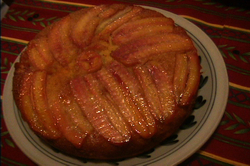 I found a lovely recipe for Banana Maple Upside Down Cake, by that inimitably wonderful Aussie cook Bill Granger. What's not to like? I like upside-down cake. I like maple syrup a lot. I like bananas when they're not in cake. Maybe if they were trapped in yummy maple-caramel they would taste like Bananas Foster and wouldn't pollute the cake part with the banana smell. And at least it 's an easy cake; it wouldn't take too much time or work. As you can see, I was making a sincere effort to set this up so that it might be something I'd like. I was really trying to meet banana cake at least halfway. But to be honest, I did have a sneaking suspicion about the outcome. And there was a factor which only added to the trauma of cooking something I was pretty sure I wouldn't like. Due to time constraints, I was baking this cake on my birthday, when I would have much preferred to be baking the Chocolate Trianon Cake that Bakerina posted the other day. It came out perfectly well, the bananas glazed in their lovely maple coating. The cake was light and beautifully risen. 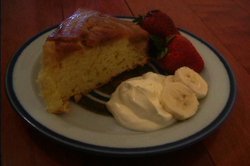 I plated it with strawberries, crème fraîche and banana slices. I took pictures. I hated it. I hated it on my birthday, when I served it warm from the oven as Bill Granger suggests. I ate an entire (albeit slim) slice, just to give it a fair chance. I hated the smell of it yesterday, and I hated it tonight, when I cut a nice big wedge for G to have with his tea. It has exactly that particular scent and flavor that I loathe about banana bread and cake. But the banana slices dipped in crème fraîche were absolutely delicioius.